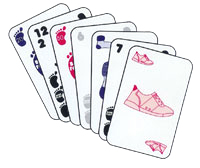 Enjoy a card game that that will be both familiar and completely new to you. With some elements similar to Canasta, you will find that the game is easy to play and yet catches and keeps your interest with new and exciting features. Try it today and see for yourself. Warning - contents can be addictive!